Suddenly, most of the summer bugs seem to have disappeared to leave your usual autumn suspects: wasps, a few Bombus pascuorum, garden spiders and plenty of flies. There is a common bug, though, that hangs on year round. 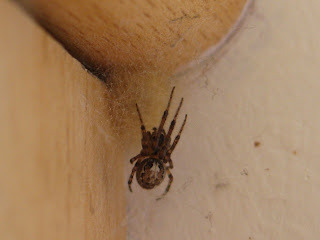 It is the window frame spider, Zygiella x-notata. 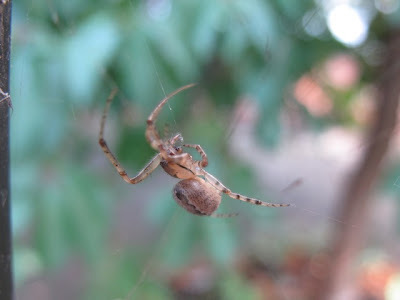 This species is an orb spider (related to the Garden Spider, Araneus diadematus) which spins its webs on gates, window frames, wheelie bins and other flat surfaces associated to human constructions. 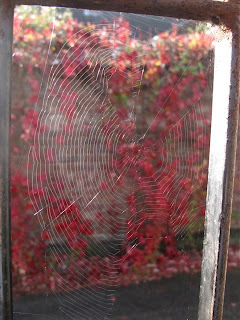 The web is quite recognisable, as it has a sector with no connecting threads in it, it is thought to be adapted to be built in such flat dimensions by keeping the signal thread free from getting tangled in the sticky connecting threads. The signal thread runs in the middle of this sector and allows the spider to detect any vibrations due to insects trapped in it. During the day, the spider hides in a silky tube on a corner, with the first pair of legs touching the signal thread that leads to its web. At night she is often seen either just outside the retreat or on the web, in a more similar way to garden spiders. 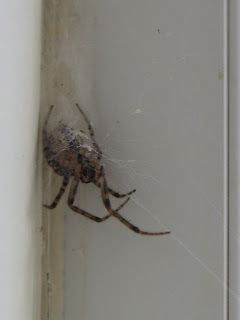 This one used to live inside the kitchen window. Eventually, she laid her eggs and spun a cocoon for them. She sat on the cocoon until she died. I guess this house is already abandoned. That's why spiders build their home in every corner of this house. My non-abandoned porch has lots of them.